A little bitty "muchacha zukin" lives in a happy forest called "muchacha." She has a mysterious powers to bring happiness to those who seek it. She will give you a little bitty happiness to you, too! "muchacha zukin" wears a felt bluish green top inspired by leaves, with a yellow skirt with a muchacha's signature basket print on it. 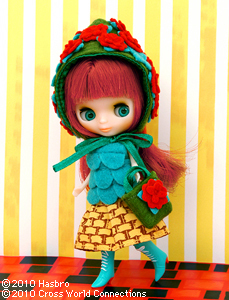 Her "zukin" (hood) is made of a green felt, and a lot of cute red flower are sew on it. The flowers are double-layered with green leaves at the bottom to give a depth. She ties the satin ribbon under her chin to wear the hood. Her bag has a red flower on it, too and perfectly matches the hood! There is a four-leaf clover print on her underwear and it is her lucky charm. 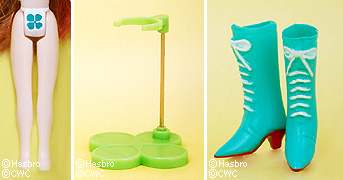 Her long boots are bluish green, with red soles and heals and white strings. 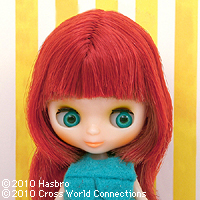 Her hair style is a two-tone long hair with bangs that reaches to her hips. The hair color is red outside and light brown inside. 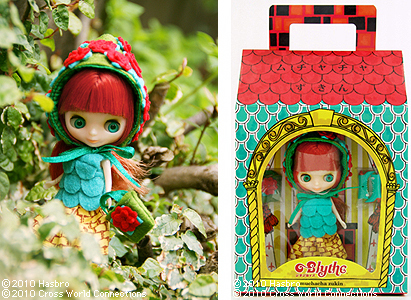 Her skin type is translucent like Petite Blythe "Little Retro Mama." Her makeup is a yellowish green eye shadow with orange lips and blush. The stand is yellow green, and the stool is gold. 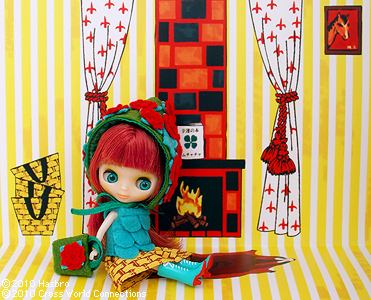 [ The set includes: ] Doll, no sleeve top, skirt, "zukin (hood)," bag, boots, and stand.